Here’s another offering for your healthy-and-light(ish)-but-still-delicious files. I picked up the January/February 2011 issue of Cooking Light at the grocery store on a whim, and was pleasantly surprised by the number of tempting recipes and useful tips and techniques within. We’ve tried a few in the last few weeks, some of which (Mediterranean stuffed chicken with hummus, olives, and feta – this was SO good, and I’ll be posting it here once we’re able to perfect it) were more successful than others (beef and butternut squash tagine – fairly bland and boring, which a tagine should never be). But after flipping through the magazine a few times, the recipe I kept coming back to was one of the simplest, probably because it featured some of my favorite things: kale, garbanzo beans (chickpeas), Greek yogurt, and bacon. 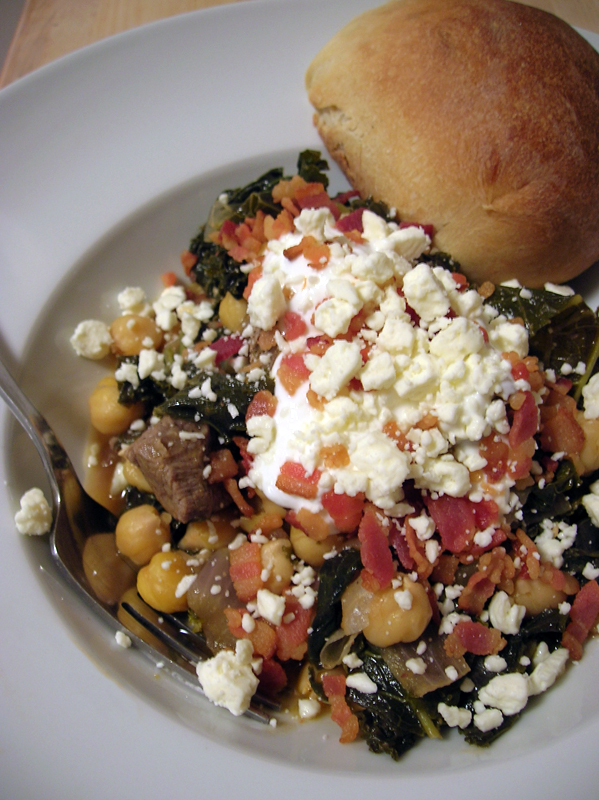 Rustic Greens and Garbanzo Beans with Beef, topped with Greek yogurt, feta cheese, and bacon. Yum. The original version of this recipe seemed to lean toward the middle east a bit, but we took it in a more Mediterranean direction by ditching the carrots and cumin in favor of tomatoes, basil, and a bit of Greek oregano. We used dried garbanzo beans instead of canned. We added some cubed lean beef to add some heft and extra protein, and garnished with feta in addition to the yogurt for salt, tang, and overall deliciousness. And the end result was one of the most delicious things to come out of our kitchen in recent memory. Ignore the bacon in this recipe for a second – it really only exists as a flavoring agent and textural element. The important things here are the kale, which like all dark leafy greens is just chock full of nutrients like vitamin C, vitamin K, and beta carotene; the garbanzo beans, which provide vital protein and are high in healthy minerals like iron, magnesium, calcium, and zinc; and the yogurt, which is fat-free, creamy, and high in calcium and healthy probiotics. These are the nutritional linchpins of the dish – everything else just serves to elevate and round out the flavor profile. All my favorite things in one bowl of deliciousness. The day before you want to cook, place the garbanzo beans in a bowl with 1/2 tsp kosher salt and enough water to cover the beans by at least one inch. Soak overnight for a minimum of 12 hours. The next day, drain and rinse the beans, then place in a large saucepan with 1 tsp salt and enough water to cover by one or two inches. Place the pan on high heat and bring to a boil then reduce to low and simmer until beans are tender. This can take anywhere from 45 minutes to 2 hours – test a bean for doneness at 45 minutes, then again every 15 minutes until they are properly cooked. Drain and set aside. Place the tomatoes, basil, and chicken broth in a blender and puree until smooth. Add the paprika, red pepper flakes, and oregano (rub between your palms to release the aromatic oils in the dry herbs before adding) and blend quickly to combine. Place a Dutch oven over medium heat and add the chopped bacon. Cook the bacon slowly to render out the fat, stirring regularly to ensure the meaty parts cook evenly. When the bacon is crispy, remove from the pan with a slotted spoon and place on paper towels to drain. Set aside. Sprinkle the cubed beef with kosher salt and freshly-ground black pepper, then add to the bacon fat in the pan. Sear on all sides, then remove to a plate. Add the onions and garlic to the pan and sautee, using a wooden spoon to scrape up any browned meaty bits from the bottom of the pan. When onions have softened, add the kale to the pan and sautee until it begins to wilt. Add the tomato and broth mixture to the pan and stir to combine, then reduce heat to low and cover. Simmer gently for half an hour or so, until the kale is mostly tender and the liquid is reduced by half. 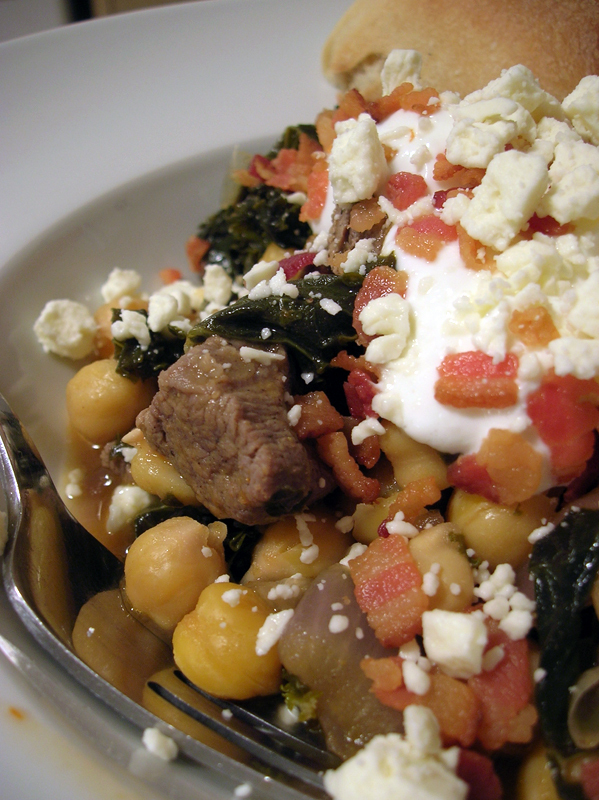 Uncover and add the cooked garbanzo beans and seared beef. Continue to cook until most of the liquid as cooked off (you want it to stay just a bit liquidy, like a stew). Remove from heat and add the lemon juice. To serve, spoon the mixture into 4 wide, shallow bowls and top each serving with a dollop of yogurt, a tablespoon or so of feta, and 1/4 of the crumbled bacon. Enjoy hot with a hunk of warm, crusty bread to sop up the delicious juices. (Note: Since there’s just the two of us, we saved half the batch and just used all the crumbled bacon on our two servings. It was equally good reheated the next day for lunch, even without the bacon. This entry was posted in Food, Drinks and Cooking and tagged beans, beef, cheese/dairy, dinners, greek/mediterranean, recipes, vegetables. Bookmark the permalink.